Back on July 5, I posted a copy of the below photograph as an 'occupational photograph' of my maternal grandparents, who both worked at the St. Louis Post Office. I have transcribed the names below from a piece of paper that was taped to a piece of cardboard backing I believe was originally part of a frame. The photograph and cardboard removed from the frame, had been stored together. St. Louis Division Feb. 6, 1935. Top Row: (L to R) Inspectors F.R. Mayer, F.D. Flora, J.N. Diederich, H.H. Goodwin, John Sparks, F.M. McConnell, S.A. MacLennan, C.P. Donovan, T.E. Schutt, C.C. Taul, T.F. Rhea, J.T. Nelson. 2nd Row: Inspectors A.M. O Reilly, J.B. Tunny, H.D. Allen, A.A. Mehl, M.L. Edwards, D.F. Elliott, E.J. Kupferer, W.R. Sanders, J.L. Myers, Dewey Patton, T.B Stavely. 3rd Row: Inspectors L. O'Dell, B.B. Barnes, R.A. Munroe, W.J. White, M.J. Deutsch, O.C.H. Willard, T.F. Mooney, John Lorimer, C.H. Baker. 4th Row: Foreman Leon Vaucher, Chief Clerk Geo. 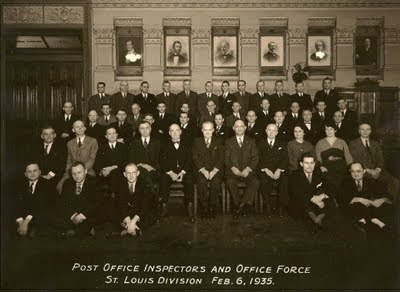 W. Guenther, Inspectors A.A. Rowe, Ira Ross, Inspector in Charge Kansas City E.O. Hallock; Chief Inspector K.P. Aldrich; Inspector in Charge St. Louis W.L. Noah; Inspector A.F. Burt, Clerks Myrtle Van Every, Bertha Baebler, Wm. Vogel. Bottom Row: Clerks W.D. Main, H.A. Wesling, Geo. Banger, Jr., R.G. Knight, R.O. Haustein. Since I have several letters (such as this one) between my grandfather, Martin J Deutsch, and Chief Inspector K.P. Aldrich, and Inspector in Charge W.L. Noah, it's nice to be able to see what they looked like as well.